Fiber is found only in plant foods. Meat and diary products have no fiber. 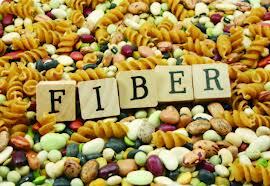 For a food to be a “Good Source” fiber means that it has to have at least 3 grams of fiber per serving. An “Excellent Source” of fiber means it has to have at least 5 grams of fiber per serving. The word “fiber” first entered the mainstream vocabulary in 1970s when the “Fiber Man,” Dr. Denis Burkitt, argued the “fiber hypothesis,” which states that fiber can prevent certain diseases. Burkitt and his colleagues found that common diseases in Western cultures (heart attacks, high blood pressure, obesity, hemorrhoids, colon cancer, and varicose veins) were not common in Africa. The primary dietary difference between the cultures was a high intake of fiber and low intake of refined carbs in Africa. While the body does not digest or metabolize fiber like it does vitamins and minerals, it provides a “time release” of vitamins, minerals, fats, and sugars during digestion, which help optimize the their metabolism. can be dealt with once and for all.